Proprietary Name: Humulin R U-500 What is the Proprietary Name? Humulin R U-500 with NDC 0002-8501 is a a human prescription drug product labeled by Eli Lilly And Company. The generic name of Humulin R U-500 is insulin human. The product's dosage form is injection, solution and is administered via subcutaneous form. FDA Application Number: NDA018780 What is the FDA Application Number? Start Marketing Date: 03-31-1994 What is the Start Marketing Date? 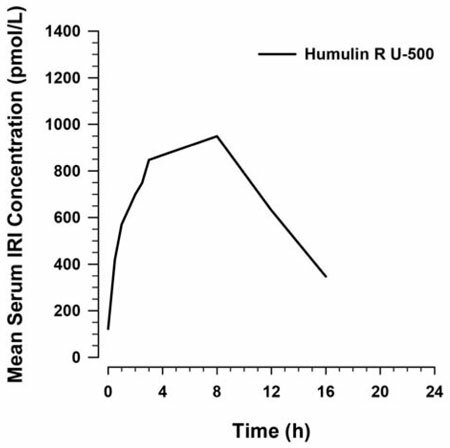 HUMULIN R U-500 is available as a KwikPen or multiple dose vial. Patients using the vial must be prescribed the U-500 insulin syringe to avoid medication errors.Instruct patients using the vial presentation to use only a U-500 insulin syringe and on how to correctly draw the prescribed dose of HUMULIN R U-500 into the U-500 insulin syringe. Confirm that the patient has understood these instructions and can correctly draw the prescribed dose of HUMULIN R U-500 with their syringe [see Dosage and Administration (2.4) and Warnings and Precautions (5.1)]. Instruct patients to always check the insulin label before administration to confirm the correct insulin product is being used [see Warnings and Precautions (5.1)]. Rotate injection sites within the same region from one injection to the next to reduce the risk of lipodystrophy [see Adverse Reactions (6)].DO NOT administer HUMULIN R U-500 intravenously or intramuscularly. Dosage adjustments may be needed with changes in physical activity, changes in meal patterns (i.e., macronutrient content or timing of food intake), changes in renal or hepatic function, changes in medications or during acute illness to minimize the risk of hypoglycemia or hyperglycemia [see Warnings and Precautions (5.3)]. DO NOT transfer HUMULIN R U-500 from the HUMULIN R U-500 KwikPen into any syringe for administration as overdose and severe hypoglycemia can occur [see Warnings and Precautions (5.4)].The HUMULIN R U-500 KwikPen is for single patient use only [see Warnings and Precautions (5.2)]. Prescribe patients a U-500 insulin syringe to administer HUMULIN R U-500 from the vial to avoid administration errors. 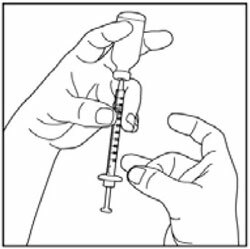 DO NOT use any other type of syringe[see Warnings and Precautions (5.1)]. Dispensing ErrorsInstruct patients to always inspect insulin vials to confirm that the correct insulin is dispensed including the correct insulin brand and concentration. Prescribing ErrorsDosing errors have occurred when the HUMULIN R U-500 dose was administered with syringes other than a U-500 insulin syringe. Patients should be prescribed U-500 syringes for use with the HUMULIN R U-500 vials. The prescribed dose of HUMULIN R U-500 should always be expressed in units of insulin [see Dosage and Administration (2.4)]. Administration ErrorsInstruct patients to always check the insulin label before each injection. 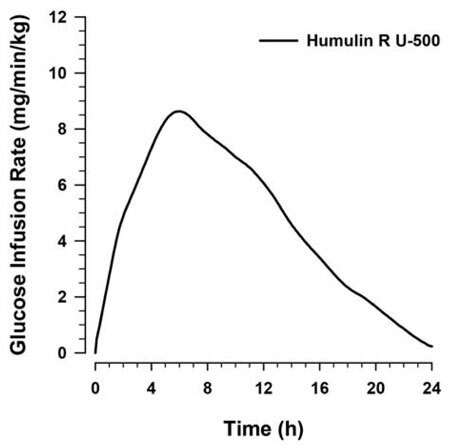 Use only a U-500 insulin syringe with HUMULIN R U-500 to avoid administration errors. Do not use any other type of syringe to administer Humulin R U-500. Adhere to administration instructions [see Dosage and Administration (2.1, 2.4)]. Risk Factors for HypoglycemiaThe timing of hypoglycemia usually reflects the time-action profile of the administered insulin formulation. 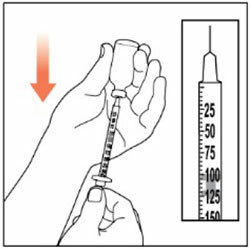 As with all insulin preparations, the glucose lowering effect time course of HUMULIN R U-500 may vary in different individuals or at different times in the same individual and depends on many conditions, including the area of injection as well as the injection site blood supply and temperature. Other factors which may increase the risk of hypoglycemia include changes in meal pattern (e.g., macronutrient content or timing of meals), changes in level of physical activity, or changes to co-administered medication [see Drug Interactions (7.1, 7.2, 7.3, 7.4)]. Patients with renal or hepatic impairment may be at higher risk of hypoglycemia [see Use in Specific Populations (8.6, 8.7)]. Risk Mitigation Strategies for HypoglycemiaPatients and caregivers must be educated to recognize and manage hypoglycemia. Self-monitoring of blood glucose plays an essential role in the prevention and management of hypoglycemia. In patients at higher risk for hypoglycemia and patients who have reduced symptomatic awareness of hypoglycemia, increased frequency of blood glucose monitoring is recommended. To minimize the risk of hypoglycemia do not administer HUMULIN R U-500 intravenously, intramuscularly or in an insulin pump or dilute or mix HUMULIN R U-500 with any other insulin products or solutions [see Dosage and Administration (2.1)]. HypoglycemiaHypoglycemia is the most commonly observed adverse reaction in patients using insulin, including HUMULIN R U-500 [see Warnings and Precautions (5.4)]. Allergic ReactionsSevere, life-threatening, generalized allergy, including anaphylaxis, generalized skin reactions, rash, angioedema, bronchospasm, hypotension, and shock may occur with any insulin, including HUMULIN R U-500 and may be life threatening [see Warnings and Precautions (5.5)]. LipodystrophyLong-term use of insulin, including HUMULIN R U-500, can cause lipodystrophy at the site of repeated insulin injections. Lipodystrophy includes lipohypertrophy (thickening of adipose tissue) and lipoatrophy (thinning of adipose tissue) and may affect insulin absorption. Rotate insulin injections sites within the same region to reduce the risk of lipodystrophy [see Dosage and Administration (2.1)]. Injection Site ReactionsPatients taking HUMULIN R U-500 may experience injection site reactions, including injection site hematoma, pain, hemorrhage, erythema, nodules, swelling, discoloration, pruritus, warmth, and injection site mass. Weight GainWeight gain can occur with insulin therapy, including HUMULIN R U-500, and has been attributed to the anabolic effects of insulin. Peripheral EdemaInsulin, including HUMULIN R U-500, may cause sodium retention and edema, particularly if previously poor metabolic control is improved by intensified insulin therapy. ImmunogenicityAs with all therapeutic proteins, insulin administration may cause anti-insulin antibodies to form. The presence of antibodies that affect clinical efficacy may necessitate dose adjustments to correct for tendencies toward hyper- or hypoglycemia. Risk SummaryAll pregnancies have a background risk of birth defects, loss, or other adverse outcome regardless of drug exposure. This background risk is increased in pregnancies complicated by hyperglycemia and may be decreased with good metabolic control. It is essential for patients with diabetes or history of gestational diabetes to maintain good metabolic control before conception and throughout pregnancy. In patients with diabetes or gestational diabetes, insulin requirements may decrease during the first trimester, generally increase during the second and third trimesters, and rapidly decline after delivery. Careful monitoring of glucose control is essential in these patients. Therefore, female patients should be advised to tell their physicians if they intend to become, or if they become pregnant while taking HUMULIN R U-500. Human DataWhile there are no adequate and well-controlled studies in pregnant women, evidence from published literature suggests that good glycemic control in patients with diabetes during pregnancy provides significant maternal and fetal benefits. Animal DataReproduction and fertility studies were not performed in animals. Absorption — In a euglycemic clamp study of 24 healthy obese subjects, the median peak insulin level occurred between 4 hours (50 unit dose) and 8 hours (100 unit dose) with a range of 0.5-8 hours. Elimination — Mean apparent half-life after subcutaneous administration of single doses of 50 units and 100 units to healthy obese subjects (N≥21) was approximately 4.5 hours (range=1.9-10 hours) for HUMULIN R U-500. Room TemperatureIf stored at room temperature, below 86°F (30°C) the pen must be discarded after 28 days. Room TemperatureIf stored at room temperature, below 86°F (30°C) the vial must be discarded after 40 days. RefrigeratedStore in a refrigerator (36° to 46°F [2° to 8°C]), but not in the freezer. Do not use if it has been frozen. Vials must be used within 40 days or be discarded, even if they still contain HUMULIN R U-500. Marketed by: Lilly USA, LLC, Indianapolis, IN 46285, USACopyright © 1997, 2016, Eli Lilly and Company. All rights reserved. Hypoglycemia is the most common adverse reaction associated with insulin, including HUMULIN R U-500. Severe hypoglycemia can cause seizures, may be life-threatening or cause death. Severe hypoglycemia may develop as long as 18 to 24 hours after an injection of HUMULIN R U-500. Hypoglycemia can impair concentration ability and reaction time; this may place an individual and others at risk in situations where these abilities are important (e.g., driving, or operating other machinery). Hypoglycemia can happen suddenly and symptoms may differ in each individual and change over time in the same individual. Symptomatic awareness of hypoglycemia may be less pronounced in patients with longstanding diabetes, in patients with diabetic nerve disease, in patients using medications that block the sympathetic nervous system (e.g., beta-blockers) [see Drug Interactions (7.3, 7.4)], or in patients who experience recurrent hypoglycemia. Severe, life-threatening, generalized allergy, including anaphylaxis, can occur with insulin products, including HUMULIN R U-500 [see Adverse Reactions (6)]. If hypersensitivity reactions occur, discontinue HUMULIN R U-500; treat per standard of care and monitor until symptoms and signs resolve [see Adverse Reactions (6)]. Thiazolidinediones (TZDs), which are peroxisome proliferator-activated receptor (PPAR)-gamma agonists, can cause dose-related fluid retention, particularly when used in combination with insulin. Fluid retention may lead to or exacerbate heart failure. Patients treated with insulin, including HUMULIN R U-500, and a PPAR-gamma agonist should be observed for signs and symptoms of heart failure. If heart failure develops, it should be managed according to current standards of care, and discontinuation or dose reduction of the PPAR-gamma agonist must be considered. Hypoglycemia [see Warnings and Precautions (5.4)]. The glucose lowering effect of HUMULIN R U-500 may be increased or decreased when co-administered with alcohol, beta-blockers, clonidine, and lithium salts. Pentamidine may cause hypoglycemia, which may sometimes be followed by hyperglycemia. Dose adjustment and increased frequency of glucose monitoring may be required when HUMULIN R U-500 is co-administered with these drugs. The signs and symptoms of hypoglycemia [see Warnings and Precautions (5.4)] may be blunted when beta-blockers, clonidine, guanethidine, and reserpine are co-administered with HUMULIN R U-500. In a euglycemic clamp study of 24 healthy obese subjects (BMI=30-39 kg/m2), single doses of HUMULIN R U-500 at 50 units (0.4-0.6 unit/kg) and 100 units (0.8-1.3 unit/kg) resulted in a mean time of onset of action of less than 15 minutes at both doses and a mean duration of action of 21 hours (range 13-24 hours). The time action characteristics reflect both prandial and basal activity, consistent with clinical experience. This effect has been attributed to the high concentration of the preparation. Figure 1 should be considered a representative example since the time course of action of insulin may vary in different individuals or within the same individual. 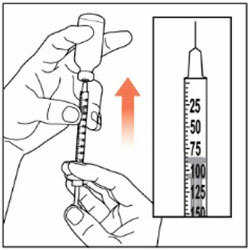 The rate of insulin absorption and consequently the onset of activity is known to be affected by the site of injection, exercise, and other variables [see Warnings and Precautions (5.3)]. Patient InformationHumulin® (HU-mu-lin) R U-500insulin human injection(500 units per mL)Do not share your Humulin R U-500 KwikPen or U-500 insulin syringes with other people, even if the needle has been changed. You may give other people a serious infection or get a serious infection from them.What is Humulin R U-500?Humulin R U-500 is a man-made insulin that is used to control high blood sugar in adults and children with diabetes mellitus who need more than 200 units of insulin in a day. Who should not take Humulin R U-500?Do not take Humulin R U-500 if you:are having an episode of low blood sugar (hypoglycemia). What should I tell my healthcare provider before using Humulin R U-500?Before using Humulin R U-500, tell your healthcare provider about all your medical conditions including, if you:have liver or kidney problems. Are pregnant, planning to become pregnant, or breast-feeding. It is not known if Humulin R U-500 will harm your unborn or breastfeeding baby.Tell your healthcare provider about all the medicines you take, including prescription and over-the-counter medicines, vitamins, or herbal supplements.Before you start using Humulin R U-500, talk to your healthcare provider about low blood sugar and how to manage it.How should I use Humulin R U-500?Read the detailed Instructions for Use that come with your Humulin R U-500. Check your blood sugar levels. Ask your healthcare provider what your blood sugars should be and when you should check your blood sugar levels.Keep Humulin R U-500 and all medicines out of reach of children.Your dose of Humulin R U-500 may need to change because of: • change in level of physical activity or exercise, weight gain or loss, increased stress, illness, change in diet, or because of other medicines you take. What should I avoid while using Humulin R U-500?While using Humulin R U-500 do not:drive or operate heavy machinery, until you know how Humulin R U-500 affects you. Shortness of breath, swelling of your ankles or feet, sudden weight gainTreatment with TZDs and Humulin R U-500 may need to be adjusted or stopped by your healthcare provider if you have new or worse heart failure.Get emergency medical help if you have:severe hypoglycemia needing hospitalization or emergency room care, and be sure to tell the hospital staff the units of Humulin R U-500 that your healthcare provider has prescribed for you. Trouble breathing, shortness of breath, fast heartbeat, swelling of your face, tongue, or throat, sweating, extreme drowsiness, dizziness, confusion.The most common side effects of Humulin R U-500 include:low blood sugar (hypoglycemia), allergic reactions including reactions at your injection site, skin thickening or pits at the injection site (lipodystrophy), itching, and rash. General Information about the safe and effective use of Humulin R U-500Medicines are sometimes prescribed for purposes other than those listed in a Patient Information leaflet. Do not use Humulin R U-500 for a condition for which it was not prescribed. Do not give Humulin R U-500 to other people, even if they have the same symptoms you have. It may harm them.This Patient Information leaflet summarizes the most important information about Humulin R U-500. If you would like more information, talk with your healthcare provider. You can ask your pharmacist or healthcare provider for information about Humulin R U-500 that is written for healthcare professionals. For more information go to www.humulin.com or call 1-800-545-5979. What are the ingredients in Humulin R U-500?Active ingredient: human insulinInactive ingredients: glycerin, metacresol, zinc oxide, water for injection, sodium hydroxide and hydrochloric acidMarketed by: Lilly USA, LLC, Indianapolis, IN 46285, USAFor more information about Humulin R U-500 go to www.humulin.com.Copyright © 2015, 2016 Eli Lilly and Company. All rights reserved. 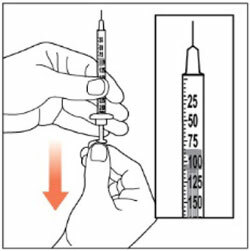 Instructions for UseHumulin® R U-500insulin human injection (500 units/mL, 20 mL vial)Please read these instructions before use.WarningsFor your safety, always inject Humulin® R U-500 insulin with a U-500 syringe.If you use another kind of syringe, you may get a dangerous overdose.U-500 syringe – for single injection onlyThe U-500 syringe has a green U-500 symbol and a green Needle Shield on the syringe. Important InformationHumulin R U-500 is a concentrated insulin.Know your dose. Your health care provider will tell you the number of insulin units that you should take. Always inject Humulin R U-500 insulin with a U-500 syringe. Other syringes will not measure your dose correctly.If you use the wrong syringe, you can give yourself a severe overdose. This can cause very low blood sugar, which may put your life in danger. For example, using a U-100 syringe can give you a 5 times overdose.If you do not have a U-500 syringe, you should contact your health care provider or pharmacist. 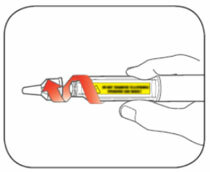 Additional Safety InformationEach line on the U-500 syringe measures 5 units of U-500 insulin. Do not share your U-500 syringes with other people. You may give other people a serious infection or get a serious infection from them.Do not mix Humulin R U-500 with other insulins in the same syringe. 1 sharps containerBefore You StartCheck your vial. Make sure it says Humulin R U-500. 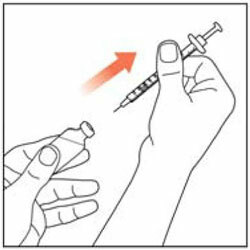 Use only a U-500 syringe to inject Humulin R U-500 insulinPrepareWash your hands with soap and water. Step 1:Find the line on the U-500 syringe that matches your prescribed dose. This is your Dose Line.Each line is 5 units. Step 2:If you are using a new vial, pull off the plastic Protective Cap.Do not remove the Rubber Stopper. Step 3:Wipe the Rubber Stopper with an alcohol swab. Step 4:Hold the syringe with the Needle pointing up. Pull down on the Plunger Rod until the Plunger Tip reaches your Dose Line. 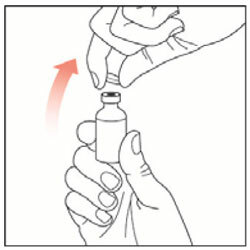 Step 5:Push the Needle through the Rubber Stopper of the vial. Step 6:Push the Plunger all the way in. This puts air into the vial. Step 7:Turn the vial and syringe upside down and slowly pull the Plunger down until the Plunger Tip is past your Dose Line. 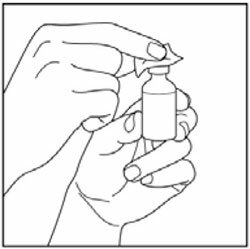 Step 8:Slowly push the Plunger up until the Plunger Tip reaches your Dose Line.Check the syringe to make sure that you have the right dose. Step 9:Pull the syringe out of the vial's Rubber Stopper. InjectInject your insulin exactly as your healthcare provider has shown you. 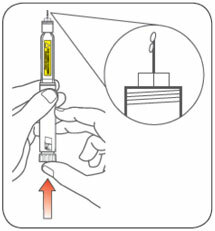 Step 10:Choose your injection site.Humulin R U-500 is injected under the skin (subcutaneously). You may inject into your stomach area, buttocks, upper legs, or upper arms.Wipe the skin with an alcohol swab. Let the injection site dry before you inject your dose. Step 12:Push down on the Plunger to inject your dose.Then keep the Needle in your skin for at least 5 seconds, to make sure you have injected all of your dose. Step 13:Pull the Needle out of your skin.You may see blood after you take the Needle out of your skin. This is normal. 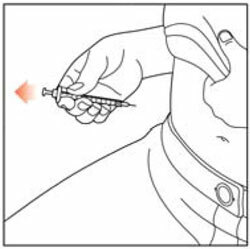 Press the injection site lightly with a piece of gauze or an alcohol swab. Do not rub the area. Disposal of used syringesPut your used syringes in a FDA-cleared sharps disposal container right away after use. Do not throw away (dispose of) syringes in your household trash. When your sharps disposal container is almost full, you will need to follow your community guidelines for the right way to dispose of your sharps disposal container. There may be state or local laws about how you should throw away used needles and syringes. For more information about safe sharps disposal, and for specific information about sharps disposal in the state that you live in, go to the FDA's website at: http://www.fda.gov/safesharpsdisposal.Do not dispose of your used sharps disposal container in your household trash unless your community guidelines permit this. Do not recycle your used sharps disposal container. Storage and HandlingKeep away from heat and out of direct light. Unopened vials:Store unopened vials in the refrigerator. After the vial has been opened:Store opened vials in the refrigerator or at room temperature (less than 86°F [30°C]) for up to 40 days. General InformationAlways use a U-500 syringe to inject Humulin R U-500 insulin.Never use other syringes. The lines and numbers on other syringes will not measure your dose correctly. 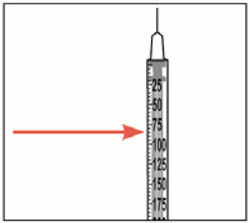 You can give yourself the wrong dose if you use any other syringe, such as a U-100, tuberculin or allergy syringe.For example, a U-100 syringe is made to measure U-100 insulin. If you use a U-100 Syringe for your U-500 dose, you can give yourself a 5 times overdose.Do not make any changes to your dose or the type of insulin you use unless you are told to do so by your health care provider. Frequently Asked QuestionsWhy do I need to use a U-500 syringe?Humulin R U-500 insulin and a U-500 syringe work together to help you inject the correct dose. Using any other syringe may result in dosing mistakes. This may put your life in danger. Do I have to convert my Humulin R U-500 insulin dose when I use the U-500 syringe?No, you do not have to convert your dose. Your health care provider should tell you how much Humulin R U-500 insulin to take in units and when to take it. Your health care provider should show you how to draw up your dose using the U-500 syringe. What should I do if I run out of U-500 syringes?If you run out of U-500 syringes, do not use any other syringe to inject Humulin R U-500 insulin. Call your health care provider or pharmacist for help. You may also call Lilly at 1-800-Lilly-Rx (1-800-545-5979). Where to get more information and helpIf you have any questions about Humulin R U-500 insulin or U-500 syringes, contact Lilly at 1-800-Lilly-Rx (1-800-545-5979). Humulin® is a trademark of Eli Lilly and Company. Copyright © 1996, 2016, Eli Lilly and Company. All rights reserved. Important:Know your dose of HUMULIN R U-500 insulin. The Pen delivers your dose in insulin units. Insulin units may not be the same as syringe markings. Ask your health care provider what your dose should be for your Pen.Your HUMULIN® R U-500 KwikPen® (Pen) works differently from other pens. It dials 5 insulin units with each click. Do not count clicks of the dose knob to select your dose. You may not get enough insulin or you may get too much insulin. HUMULIN R U-500 is a concentrated insulin. Do not transfer HUMULIN R U-500 insulin from your Pen into a syringe. A severe overdose can happen, causing very low blood sugar, which may put your life in danger.Read the Instructions for Use before you start taking HUMULIN R U-500 and each time you get another Pen. There may be new information. This information does not take the place of talking to your healthcare provider about your medical condition or your treatment. Do not share your HUMULIN R U-500 Pen with other people, even if the needle has been changed. You may give other people a serious infection or get a serious infection from them.HUMULIN R U-500 KwikPen (“Pen”) is a disposable prefilled pen containing 1500 units of HUMULIN R. You can give yourself more than 1 dose from the Pen. Each turn (click) of the Dose Knob dials 5 units of insulin. You can give from 5 to 300 units in a single injection. The plunger only moves a little with each injection, and you may not notice that it moves. The plunger will only reach the end of the cartridge when you have used all 1500 units in the Pen. Wipe the Rubber Seal with an alcohol swab.HUMULIN R U-500 should look clear and colorless. 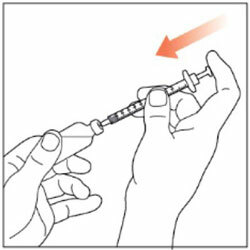 Do not use if it is cloudy, colored, or has particles or clumps in it.Step 2:Select a new Needle. Step 3:Push the capped Needle straight onto the Pen and twist the Needle on until it is tight. Step 4:Pull off the Outer Needle Shield. Do not throw it away. Step 5:To prime your pen, turn the Dose Knob to select 5 units. Step 6:Hold your Pen with the Needle pointing up. Tap the Cartridge Holder gently to collect air bubbles at the top. 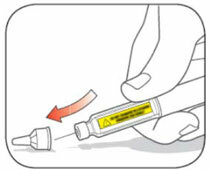 Selecting your doseThis Pen has been made to deliver the dose in insulin units that is shown in the Dose Window. Ask your healthcare provider what your dose should be for this Pen. It is normal to see a small amount of insulin left in the Pen that you cannot inject. Do not transfer this to a syringe. Severe overdose can happen.Giving your injectionInject your insulin as your healthcare provider has shown you. 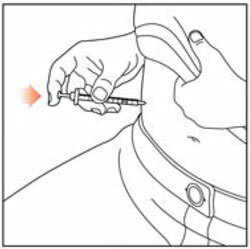 Step 9:Choose your injection site.HUMULIN is injected under the skin (subcutaneously) of your stomach area, buttocks, upper legs or upper arms. The Plunger only moves a little with each injection, and you may not notice that it moves.If you see blood after you take the Needle out of your skin, press the injection site lightly with a piece of gauze or an alcohol swab. Do not rub the area.After your injectionStep 12:Carefully replace the Outer Needle Shield. 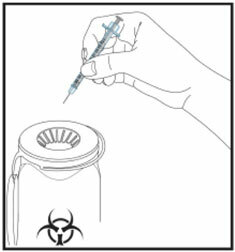 Step 13:Unscrew the capped Needle and throw it away (see Disposing of Pens and Needles section). Step 14:Replace the Pen Cap by lining up the Cap Clip with the Dose Indicator and pushing straight on. In-use PenStore the Pen you are currently using at room temperature up to 86°F (30°C). Keep away from heat and light. What you should know if you are switching to HUMULIN R U-500 KwikPenAsk your healthcare provider what your dose should be for your Pen in insulin units. Always follow your healthcare provider's instructions for dosing. Your Pen may measure your dose differently. 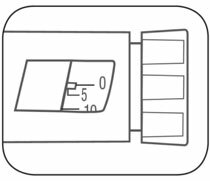 The markings in the Dose Window may not be the same as the markings on the syringe you used in the past.Ask your healthcare provider what dose in insulin units you should dial on your Pen.Switching from another type of insulin device or pen. The HUMULIN R U-500 KwikPen is different from other pens. It dials 5 insulin units with each click of the Dose Knob.Do not select your dose by counting clicks. You may not get enough insulin or you may get too much insulin.General information about the safe and effective use of your PenKeep your Pen and Needles out of the sight and reach of children.Do not use your Pen if any part looks broken or damaged. TroubleshootingIf you cannot remove the Pen Cap, gently twist the cap back and forth, and then pull the cap straight off. 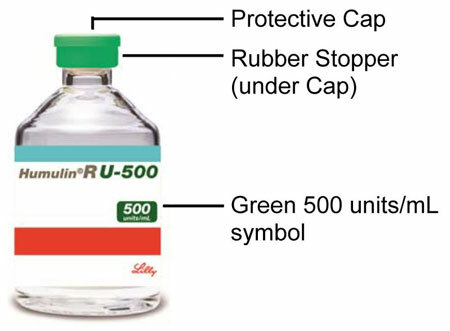 If you have any questions or problems with your HUMULIN R U-500 KwikPen, contact Lilly at 1-800-LillyRx (1-800-545-5979) or call your healthcare provider for help. For more information on HUMULIN R U-500 KwikPen and insulin, go to www.humulin.com. HUMULIN® and HUMULIN® KwikPen® are trademarks of Eli Lilly and Company. Copyright © 2015, Eli Lilly and Company. All rights reserved. HUMULIN R U-500 KwikPen meets the current dose accuracy and functional requirements of ISO 11608-1:2014. Rx only500 units/mLWarning - Highly ConcentratedIMPORTANT: Use only with a U-500 syringe. Read Humulin®R U-500 KwikPen® Instructions for Use. This device is recommended for use with Becton, Dickinson and Company's insulin pen needles.